Clawfoot tub shower curtains come in many pretty designs, colors and styles and you can choose your most favorite clawfoot tub shower curtain from all these beautiful selections of the best available clawfoot tub shower curtains online. Clawfoot tubs are classic, elegant, stylish and unique on its own and these tubs come in different materials though they were only made of cast iron and porcelain materials in the past. 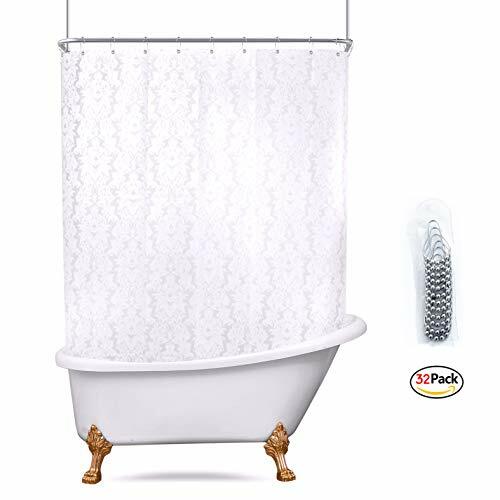 Clawfoot tub accessories including clawfoot tub shower curtains, liners, curtain rods etc are very important, and in this post we will go through clawfoot tub shower curtain ideas which will help you to find and buy the best clawfoot tub shower curtain for your clawfoot tub. Most clawfoot shower curtain problems are associated with choosing the right sized shower curtain that fits perfectly for your tub and so the clawfoot tub shower curtain solutions are mostly associated with measuring the clawfoot tub correctly and then choosing the right sized shower curtain, which are also discussed further down in this page though I wanted to quickly mention it here in the beginning of this blog post. Since the clawfoot tubs are available in different materials in modern time, though they were considered as very luxurious bathroom accessories in the past, these popular vintage style tubs come in many prices now and many are affordable too. 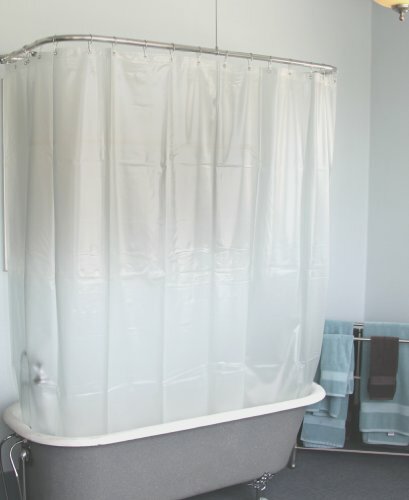 Just like the clawfoot tubs are available in different materials and different prices now, you can also find a variety of clawfoot tub shower curtains and liners perfect to be used with your clawfoot tubs. Clawfoot tubs may come in different sizes, some being longer than others and these tubs are usually deeper than regular tubs. You need to consider all these factors, including the size measurements of your clawfoot tub when you are looking to buy the best clawfoot tub shower curtain for your clawfoot tub. 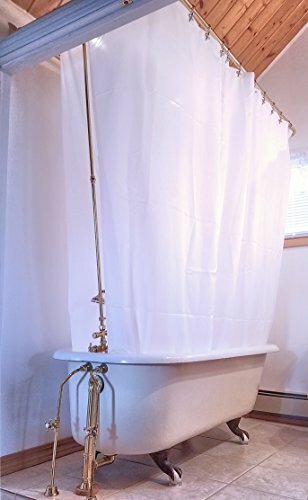 Whether you have moved into a new house which has clawfoot bathtub or if you are remodeling your bathroom or replacing your bathtub with a clawfoot bathtub, you will need the perfect clawfoot tub shower curtain for your tub. Clawfoot tub is basically a freestanding tub, which simply means they are not built in tubs in your bathroom. Since this is a freestanding tub, it means the clawfoot tubs can be classic clawfoot tubs with the known size or it can be custom made with different measurement of sizes. So the shower curtain for the classic clawfoot tub may not fit properly for custom made clawfoot tubs. That is why it is important to first make sure the size and measurements of your clawfoot tub before buying the shower curtain and liner, so you can choose the right sized shower curtain and liner for your clawfoot tub. Standard sizes for classic clawfoot tubs are usually as follows – 60″ length, 30″ width and 19″ depth. 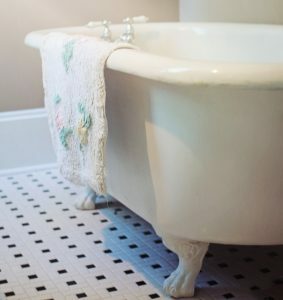 Though lengths of a clawfoot tub can vary by few inches in the measurements as clawfoot tubs can be custom made and so you need to always check the correct measurements of your clawfoot tub by yourself to be sure before buying any clawfoot tub accessories including the shower curtains, liners, rods etc. Another important thing that you need to notice while buying shower curtains for your clawfoot tub is that, since the clawfoot tub is not an inbuilt tub, this kind of tubs are not attached to the walls as usual tubs, and so the way you put the shower curtain will be different from how you put shower curtain for the regular tubs. 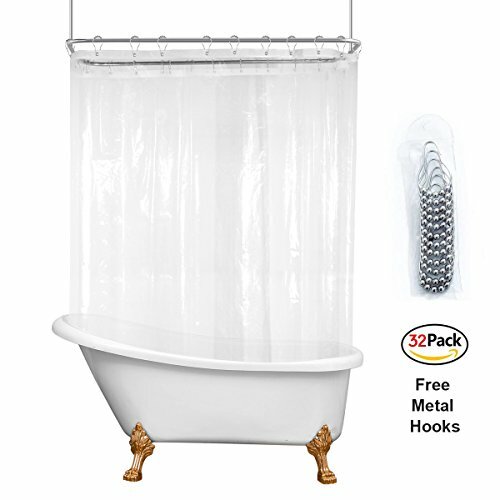 Usually you will need a curved or circular shower curtain rod that goes around the tub, and so you need a shower curtain (and liner if using) that covers the curved curtain rod completely. So make sure to keep this in mind while choosing the right sized clawfoot shower curtain for your tub. 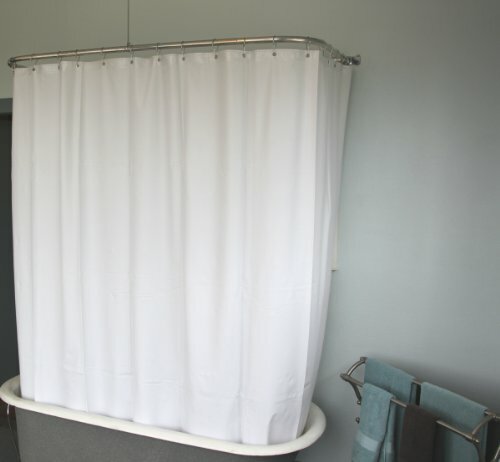 Sometimes you may also face a problem with clawfoot tub shower curtain sticking to yourself, and an easy solution to this problem is to choose the right kind of fabric for the shower curtain and shower curtain liner that won’t stick easily. So just like choosing the right sized shower curtain, it is also important to choose the right kind of shower curtain fabric and shower curtain liner fabric if you face the problem of shower curtain sticking to you. This happens because the shower curtain is not just installed on one side of the tub like you do for an inbuilt tub, but its hung around the freestanding clawfoot tub and so it can easily stick on if it is not of the right size or if it is not of the right kind of fabric. You may use waterproof plastic shower curtain and liner which can be hung around the whole clawfoot tub, if you have a concern about the shower curtain sticking to you. So here let us see some of the best clawfoot tub shower curtains available online from which you can choose your favorite shower curtains after checking the size requirements for your clawfoot tub. 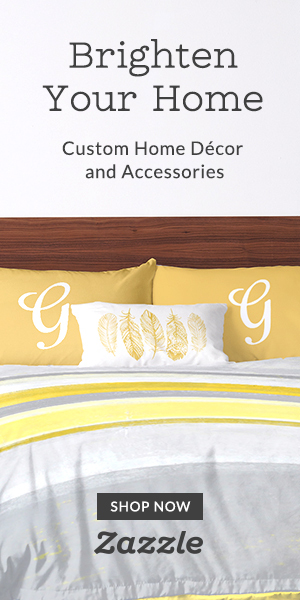 Make sure to go to the product page and check the product descriptions to make sure that you understand all features of the shower curtain, when you decide to make a purchase. 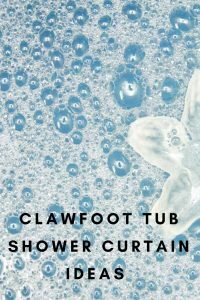 Hope you found this post on clawfoot tub shower curtains helpful in finding some of the best shower curtains to be used in clawfoot tubs!